AccuWeather Global Headquarters – October 04, 2017 – AccuWeather reports some chilly winter weather is in store for the Northeast and mid-Atlantic, with January threatening to bring the coldest air of the season. Although however cold, low temperatures will pale in comparison to those in the northern Plains where the mercury is set to dip to minus 30 degrees Fahrenheit at times. Meanwhile, the southern Plains, Southwest and California can expect a milder and drier winter than last season. A chilly winter is in store for the Northeast and mid-Atlantic, particularly when compared to last year. For most of both regions, this will translate to an above-normal snow season. New York City and Boston, Massachusetts, may be the exceptions to this, with early predictions calling for 6 inches of snowfall or more above normal in both cities. Areas prone to lake-effect snow will also see high totals, including Cleveland, Ohio; Erie, Pennsylvania; and Buffalo, New York. Farther south, air temperatures will face an east-west divide. “The Southeast is going to run above normal, especially in Florida and Georgia,” Pastelok said. Both states will be at a lesser risk for a damaging freeze this year. Additionally, Florida will remain mostly dry – good news for those recovering from Irma’s impact in the fall. Meanwhile, western areas are more likely to receive bouts of colder weather. “We are expecting a few ice storms to develop based on the pattern we’re seeing right now,” Pastelok said. Two to three are predicted to hit from the Tennessee Valley to northeast Texas. Tornadoes are not out the question for either region. The area from Texas to Georgia was hit with 137 tornadoes last January. This year, frequent tornadic activity may spin up in February. Arctic blasts are set to freeze the northern Plains this winter with temperatures sinking to subzero levels on a regular basis. Temperatures could plummet to minus 30 F at times in the Dakotas, Pastelok said. However, the frigid conditions are a trade-off for less snowfall. The winter of 2016/2017 spawned colossal storms, dropping 140 percent of normal snowfall over the northern Plains and northern Rockies, according to Pastelok. This year will feature much less snow and drier conditions overall. 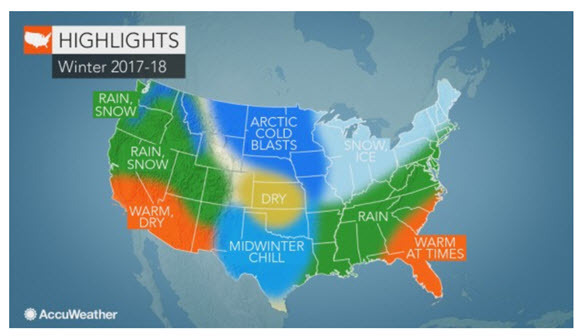 The southern Plains will experience back-and-forth temperatures this season, with the middle of the winter being most likely to bring chilly conditions. “Colder air masses will bleed down and lead to freezes in later January,” Pastelok said. Though the wintry air will be memorable, a cold winter isn’t predicted overall. Some areas, such as southwest Texas, will average above normal for the season. Dry periods will dominate over stormy weather overall. Dry periods will be welcomed by many following the havoc wreaked by Harvey near Houston. With a weak La Niña predicted to develop this winter, the Northwest and the Rockies are set to receive an abundance of precipitation. “I think the Bitterroot chain all the way down to the Wasatch region in the central and northern Rockies has a good shot to be above normal on snowfall this season,” Pastelok said. The Cascades are also predicted to benefit from abundant snowfall. “It’s a good area to head out to if you’re a big skier,” Pastelok said. After a big season for snowfall in central and Northern California last year, both regions are predicted to be less wet and snowy in the upcoming months. However, it won’t spell bad news for ski season. Ski resorts will receive enough snowfall to create good conditions, but not so much that people struggle to get to them, he said. In the Southwest, drier and warmer weather will dominate. According to Pastelok, warmth will bookend the winter with temperatures capable of reaching into the 90s by early 2018.